High Strangeness: My Visit to a Real UFO Landing Site! A few hours later we were traveling through western Kentucky, and came upon the exit for a town called Hopkinsville. I had noticed it on the drive down but hadn't had the time to stop. But I made a solemn vow that we would pull over on the way home and see what there was to see. My wife Mxxxxx understood. 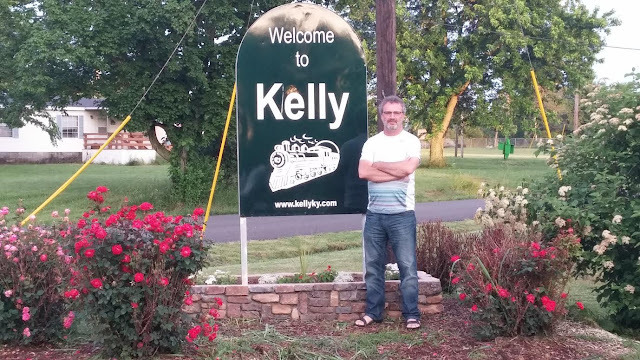 Hopkinsville, Kentucky, you see, is right up the highway from Kelly, Kentucky, and together they form the site of the "Kelly-Hopkinsville" alien invasion... How could I not stop? 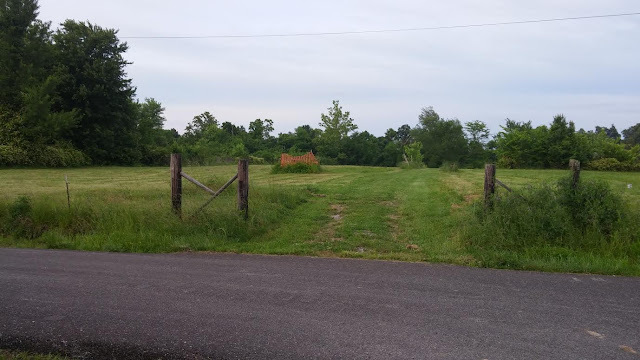 In August, 1955, the Sutton family were enjoying a quiet Sunday night with some friends on their isolated farm off the Old Madisonville Road in Kelly, when a UFO landed in the gully behind the house. 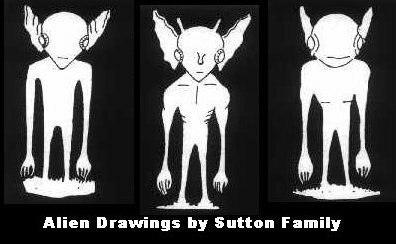 Soon after, strange little creatures -- "shiny men" -- started to approach the house, apparently trying to get it... For 4 hours the Suttons fought off the little creatures with rifles and shotguns, but the little things seemed impervious to gunfire... Finally, frightened out of their wits, the family made a run for it, packing into two pickup trucks and racing to the police station in Hopkinsville. Somewhere back in those woods... two worlds met. This, I believe, is the entrance to the Sutton farm, or at least this is pretty damn close. It leads east into the woods and into a gully off the Old Madisonville Road, seen here. It's a very quiet place, and if you listen hard you can almost hear the gunshots of the terrified Sutton clan as they fought off the invaders... I would have walked back to the woods, but I wasn't sure if this was private property, and I didn't want to hear -- or feel -- any modern day gunshots. Pretty cool moment, though. Honest-to-God UFO landing sites are few and far between, so it's a real kick to actually get to see one, exactly as it was when the UFO landed... The case was never explained by the Air Force's Project Blue Book, because it was never investigated by Blue Book. 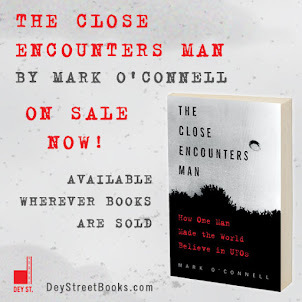 But Dr. J. Allen Hynek new and trusted the two civilian investigators and felt that something very real had happened to the Suttons that night. Can you see why I wanted to see the site of the world's most famous alien invasion? 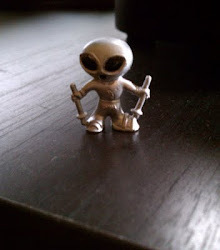 Even today, 60 years later, the incident is still shrouded in mystery... Give me a case like this over Roswell any day. That's actually the adjacent property. It is where they do the yearly Kelly Little Green Men festival every August though! I know, but the sign says "Kelly" in big letters!